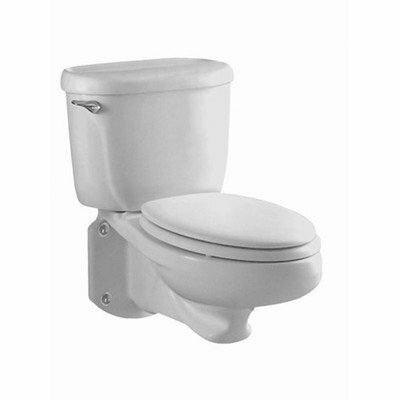 This wall mounted toilet from the Glenwall collection by American Standard is constructed of vitreous china and features a pressure assisted siphon action elongated jet action bowl. Close-coupled flushometer tank. Toilet includes a side-mounted chrome metal trip lever and a sanitary bar on bowl. Easy, speed connect tank-to-bowl coupling system. Includes toilet only, seat and supply not included. Overall dimensions of this toilet are 29-1/2 inches L x 19-1/2 inches W x 30 inches H. There is a fully glazed 2-1/8 inch trapway with 2 inch minimum ballpass. The water surface area measures 10 inches x 12 inches. Required working pressure range of this toilet are 25-80 psi. Toilet is available in linen. 2093.100.222.